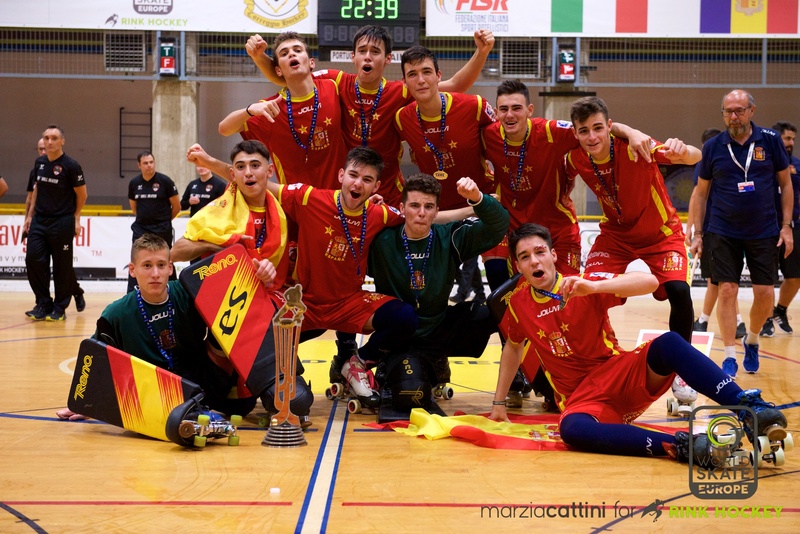 Spain is the new U17 European Champion and won its 18th gold medal yesterday at the end of the 38th edition of the U17 European Championship played in Correggio (Italy). The Spanish team raised the trophy at the end of a top-level, thrilling and amazing “final” against Portugal, in a sold-out sports hall. Due to the results of the previous two days, Spain had to win the game in order to get the title. Portugal scored first with Lucas Santos, but Spain immediately tied with Manel Hernandez and then went ahead thanks to Abel Moya. Before halftime, Rodrigo Martins for Portugal and Aleix Marimon fixed the result to 3-2 for Spain. In the first 48″ of the second half, Diogo Barata scored twice for Portugal, putting his team ahead again. The goal the tied the game again was scored by Moya during the 10th minute, then Spain furiously attacked tightening Portugal in his defensive zone, creating lots of opportunities without scoring. When there were only 50″ last, Spain decided to substitute his goalkeeper with a fifth player and 15 seconds later, a shot by Oriol Llenas fixed the result to 5-4, moving the title of European Champion from Portugal to Spain. In the previous game of the day, France defeated Italy and got the third position. Andorra won the group from 5th to 9th place. Standing: Andorra 10, Switzerland 9, Germany and England 4, Israel 1. Standing: Spain 9, Portugal 6, France 3, Italy 0.